HVUT Form 2290 is due by Jan 31st for vehicles first used since December 2017. E-File soon. E-filing has emerged to be one of the modern revolutions which help the tax payers to securely file & pay their Federal Excise Tax Returns with the Internal Revenue Service. The primary reason for introducing E-filing is to lessen the burden of a tax payer during their tax deadline. It puts them aside off scheduling appointments at the local IRS facility and sparing a day’s time to have your turn arrived before you reach the counter. Guess the worst part, any last moment corrections are not honored else than starting all over again. Instead sit back, relax and e-file your Form 2290 through www.truckdues.com in matter of minutes. Today, we are approaching you with this article to remind you about the near term Form 2290 HVUT tax deadline which is due by Oct 31, 2017 for vehicles which are in operation since September 2017. Any Heavy vehicle that possess a minimum gross weight of 55000 lbs is liable to be reported on a Form 2290. But the Tax payment factor is determined by the number of miles travelled. When the vehicle exceeds 5000 miles in case of commercial based operation or 7500 miles in case of Agricultural purpose. When the vehicle doesn’t meet its desired mileage limit within a respective tax year the vehicle is basically classified to be exempt from paying the HVUT taxes to the Internal Revenue Service. However, the vehicle is required to be reported over the Form 2290 to justify its cause for exemption during audits & Road side inspections. The best part of E-filing is its turnaround time. Need not wait until few business days after filing to hear a response back in mail. Whereas, the general turnaround time while E-filing is mere few minutes. Soon after you e-File you’d be able to print the IRS digital watermarked copy of Schedule 1 in your registered e-mail address and the same can be printed out for documentation purposes during vehicle registration. 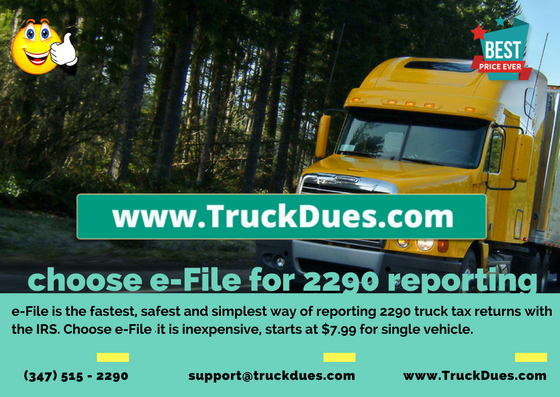 Truckdues.com is rated to be one of the reliable and nominally charging websites to E-file the HVUT Form 2290. It has earned its trust among many independent truckers, trucking companies and major trucking communities across our nation. E-filing begins here as low as $7.99. Why waiting until the deadline when we got E-filing as an option. Log on to www.truckdues.com and 8E-File your Form 2290 before Jan 31, 2017 to stay away from the IRS penalties and interests. This entry was posted in 2290 e-file, EIN, Form 2290, Truck Tax Online and tagged 2290 e file, Agriculture Vehicle, American Trucking, can form 2290 be efiled, can you e-file form 2290, e file form 2290 irs, e-file for form 2290 excise tax filers, e-file-Form-2290, e-filing your form 2290, ein, Form 2290, Form 2290 Amendment, form 2290 application, form 2290 category w, form 2290 contact number, form 2290 download, form 2290 due, form 2290 e file providers, form 2290 exemption, form 2290 explained, form 2290 extension, form 2290 federal excise tax, form 2290 filing date, form 2290 heavy highway vehicles, form 2290 help, form 2290 highway use tax, form 2290 instructions 2017, form 2290 irs online, form 2290 july 2017, form 2290 late penalty, form 2290 renewal, hat is heavy highway vehicle use tax, heavy duty truck tax, heavy goods vehicle tax bands, heavy goods vehicle tax rates, heavy highway motor vehicle use tax, heavy highway vehicle tax 2290, heavy highway vehicle tax return, heavy highway vehicle tax return form 2290, heavy highway vehicle use tax online, heavy highway vehicle use tax refund, heavy highway vehicle use tax return, heavy highway vehicle use tax return form 2290, heavy highway vehicle use tax return online, heavy truck excise tax, heavy truck fuel tax, heavy truck highway tax, heavy truck highway use tax, heavy truck road tax, heavy truck road use tax, Heavy Truck Tax, HEAVY TRUCK TAX 2290, heavy truck tax deduction 2017, heavy truck tax form, heavy truck tax irs, heavy truck tax write off heavy vehicle use tax online filing, heavy truck use tax, heavy vehicle excise tax, heavy vehicle fuel tax credit, heavy vehicle road tax, Heavy vehicle tax, heavy vehicle tax 2290, heavy vehicle tax break, heavy vehicle tax clearance hawaii, heavy vehicle tax credit, heavy vehicle tax credit 2017, heavy vehicle tax deduction 2017, heavy vehicle tax form 2290, heavy vehicle tax payment, Heavy Vehicle Use Tax, heavy vehicle use tax cost, heavy vehicle use tax due date, heavy vehicle use tax exemption, heavy vehicle use tax exemption form, heavy vehicle use tax fees, heavy vehicle use tax filing, heavy vehicle use tax form, heavy vehicle use tax instructions, heavy vehicle use tax online, heavy vehicle use tax questions, heavy vehicle use tax refund, heavy vehicle use tax return, heavy vehicle use tax return form 2290, heavy vehicle weight tax, how do i e file form 2290, how to e file form 2290, HVUT, hvut 2017, HVUT 2017 -2018, hvut 2290, hvut 2290 due date, hvut amount, hvut cost, hvut due date, hvut filing, hvut form 2290, hvut form 2290 instructions, hvut form 2290 online, hvut instructions, hvut tax, IRS, irs form 2290 contact number, irs form 2290 due date, irs form 2290 e file, irs form 2290 instructions 2017, irs form 2290 mailing address, irs form 2290 online, irs form 2290 payment, irs form 2290 pdf, irs form 2290 questions, irs heavy vehicle tax form, IRS watermark, is form 2290 filed annually, Late 2290, Late HVUT fees, Late HVUT payment, Owner Operators, pay heavy highway vehicle use tax online, pay heavy highway vehicle use tax return online, pay heavy vehicle tax online, semi truck tax deductions, semi truck tax depreciation, Truck Licensing, Truck Tags, truck tax online, Truck Tax Online 2290 e file, Truckers, Vehicle Identification Number, VIN Correction, what is a form 2290, what is the heavy highway vehicle use tax, when is a 2290 form due, where to pay heavy highway vehicle use tax on January 24, 2018 by Truck Dues.